Joshua Thomas and the book wagon. Joshua Thomas, a Civil War veteran and member of the GAR, had earlier served as the janitor in the library. He was listed on the 1910 census as a "Book Missionary" for the public library. 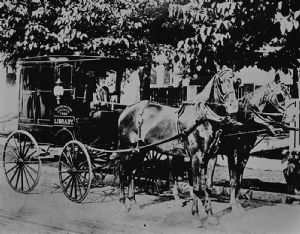 It was reported that the horses names were Dandy and Black Beauty, and that they were stabled at Corderman's Livery Stable in Hagerstown.